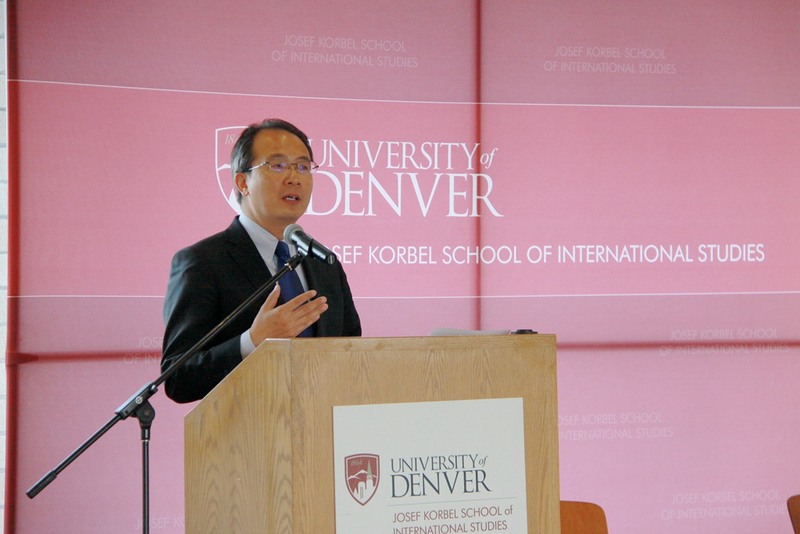 On September 26, Consul General Hong Lei delivered speech titled as China's New Development and China-US relations at the University of Denver. 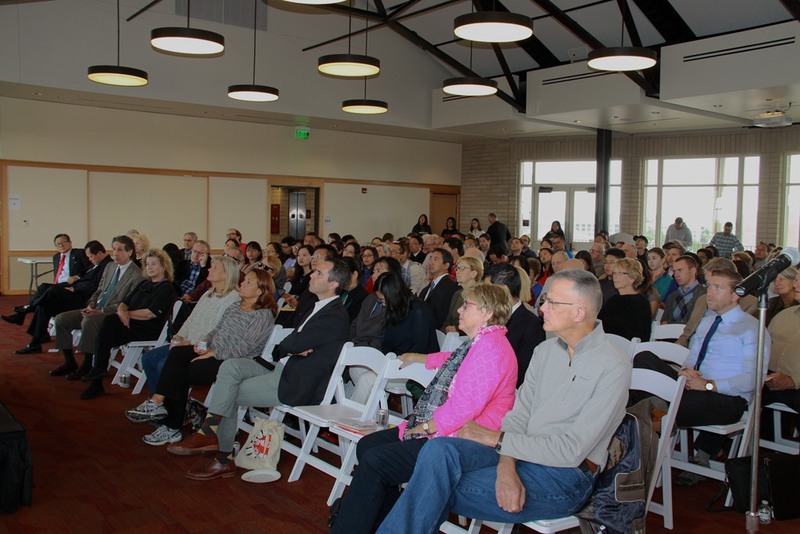 An audience of over 200 people including Counselor of Education Chen Yinghui, faculty and students from the School of International Studies, and representatives from political, business and academic sectors in Colorado attended the speech. Consul General Hong Lei said that since the Communist Party of China convened the 18th National Congress, China has taken solid steps in completely building a moderately prosperous society, made breakthroughs in comprehensively deepening reform, registered positive progress in implementing the rule of law, and achieved in-depth progress in comprehensively strengthening the ruling party discipline. The Chinese people have made remarkable achievements in politics, economy, society and culture which has drawn worldwide attention. The 19th CPC National Congress will point out direction and lay out plans for China’s development in the next 5 yeas and beyond, and lead China’s efforts to completely build a moderately prosperous society and make new progress in building socialism with Chinese characteristics. From a new historical starting point, China will surely make more and bigger contribution to the great cause of world peace and development. Consul General Hong Lei said that China-US relations are the world’s most important bilateral relationship. Maintaining and developing the relationship is not only in line with the interests of the two peoples, but also the common expectation of the international community. Since China and the United States established diplomatic ties 38 years ago, thanks to joint efforts of successive leaders and the peoples of both countries, China-US relations have achieved historic development. President Trump is invited for a state visit to China in the latter half of the year. We would like to work with America to follow the consensus reached by the two leaders, adhere to the principles of non-confrontation, non-conflict, mutual respect and win-win cooperation, strengthen strategic communication, expand pragmatic cooperation in different fields, solve differences and sensitive issues appropriately, promote cooperation to achieve more consensus and outcome, so as to open up brighter and wider prospects for the bilateral relationship and bring more benefits to peoples in our two countries and beyond. Consul General Hong Lei said sub-national cooperation is the foundation for friendly China-US relationship and is an endless power to drive forward the China-US relations.The cooperation between the nine Midwest states within our consular district and China has expanded on a grass-root level. The economic and trade cooperation has deepened and people to people exchanges have become increasingly close and frequent. Colorado is an important state in the Midwest and is one of the high-tech bases in America. China is willing to work with different communities in Colorado to promote exchanges and cooperation in different sectors between the two sides. After the speech, Consul General Hong Lei answered questions from the audience on China-US relations, the South China Sea issue, Korean nuclear issue, and climate change, etc.